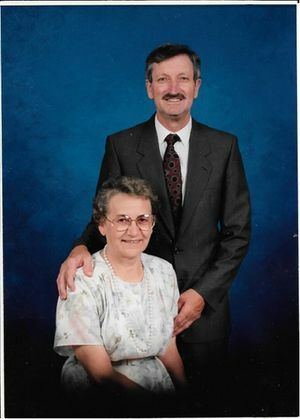 Art and Marie Neufeld, long-serving pastor, ca. 2003. Several members of the Evangelical Mennonite Conference moved to the Kola, Manitoba, area starting in 1956 for reasons of farming and business (based on lumber and construction). Together with other Mennonite people already in the area, Bible studies and worship services were soon begun. The language of worship was English. In 1958 the EM Conference sent the Abe Ungers for a year to get a church established. Kola EMC was officially founded in 1959 while the Abe Ungers were still in the area with Art Neufeld elected as a minister and Dave Plett as a deacon. After the Abe Ungers left, Art Neufeld continued serving as the lead minister. Other ministers and deacons were elected in the subsequent years. Art Neufeld served as a well-loved and respected pastor or associate pastor almost until his death in 2003. A building was erected in 1957. Two years later work was begun on a more substantial building. Finally, in 1962 the older building was sold to Heron EMC that was starting at Maryfield, Saskatchewan, and the newer building was fully occupied. Later renovations saw an education wing and a larger entrance area added. The church grew fairly rapidly as farming and business developed in the community. Klassen, Richard. "Kola Evangelical Mennonite Church (Kola, Manitoba, Canada)." Global Anabaptist Mennonite Encyclopedia Online. August 2017. Web. 19 Apr 2019. http://gameo.org/index.php?title=Kola_Evangelical_Mennonite_Church_(Kola,_Manitoba,_Canada)&oldid=156066. Klassen, Richard. (August 2017). Kola Evangelical Mennonite Church (Kola, Manitoba, Canada). Global Anabaptist Mennonite Encyclopedia Online. Retrieved 19 April 2019, from http://gameo.org/index.php?title=Kola_Evangelical_Mennonite_Church_(Kola,_Manitoba,_Canada)&oldid=156066. This page was last modified on 9 December 2017, at 19:42.